With EPA-registered antimicrobial mold inhibitor formula throughout, Everlast® Epoxy flooring naturally impedes the growth of microorganisms, keeping your showers and walls clean, hygienic and healthy, even in the wettest conditions. While other floors are coated with an antimicrobial layer, once that layer has been breached your floor and walls are left unprotected. Everlast® Epoxy flooring is antimicrobial through and through, giving you the added protection you need and deserve. Everlast® Epoxy Flooring offers a uniform, resin-rich, troweled-on system that forms a physical bond between the material and the surface, permanently affixing them together. The end result? An unbroken, continuous surface that is non-porous, waterproof, and self-containing. Walls and floors are also chemically resistant against urine, strong detergents, and disinfectants, helping curb bacterial and fungal growth and keeping your shower looking newer longer. And, of course, there’s the slip factor—showers get wet, and it can be hard to prevent slips and falls. Everlast® Floors have a marble chip texture that leaves surfaces pebbled, coarse and ribbed but, still, non-abrasive surface. 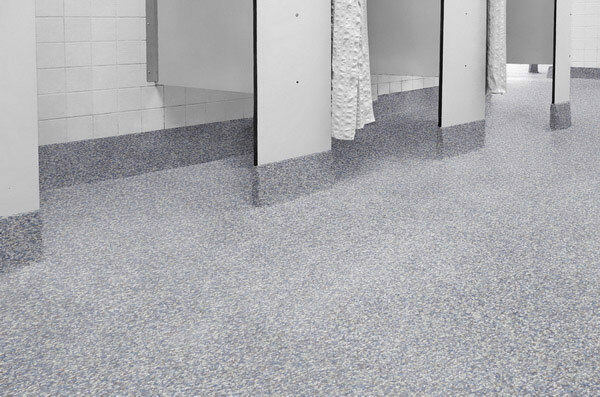 This finish helps prevent slips while keeping users comfortable and clean. Everlast® Epoxy coating bonds with most existing surfaces and drains, so there’s no space left for water to seep in. Instead, water, chemicals and other liquids simply wash down the drain—along with YOUR concerns about the integrity of your shower surface! Whereas other epoxy flooring is hard and brittle, Everlast® Epoxy is strong, tough, and flexible. The reason? Most epoxy flooring is short on resins but long on aggregate. More aggregate means a weaker floor and a higher profit for the installer—but that’s not how we do business. At Everlast® Epoxy, we never cut corners. 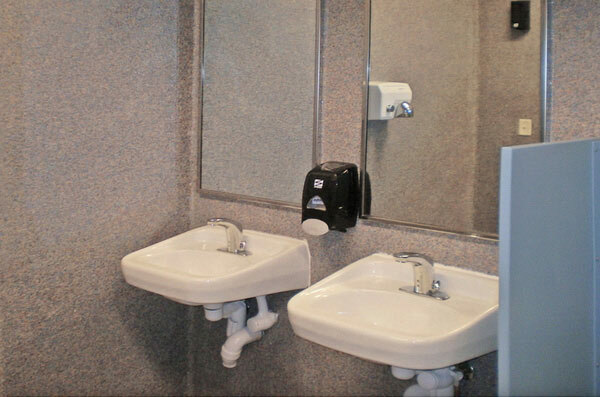 Our goal is for our customers to be 100% satisfied, and that means having a long-lasting, safe and clean surface from day one on. Other floor coatings are, in most cases, 160 mils thick. 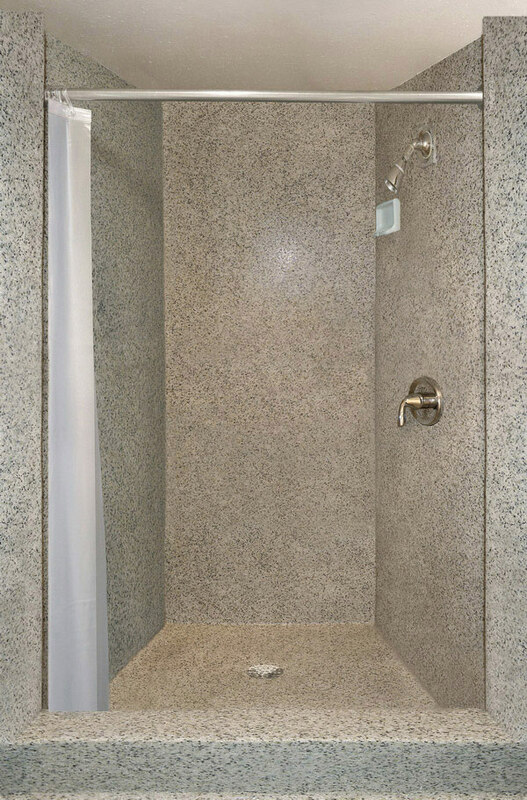 Because our solutions are long on high-quality resins—and because we use the correct amount of aggregate—our shower floors and walls boast a superior, thinner surface while, still, keeping water away from your drywall. Everlast® Epoxy Flooring is available in a dozens of colors to sync with any decor. Our expert team can also match your company’s color palette or, even, be produced with your logo or branding. Get in touch to learn more. Call today for a FREE sample and estimate and learn more about our shower flooring and wall options, installation process and pricing.